The GNU Free Documentation License (GNU FDL or simply GFDL) is a copyleft license for free documentation, designed by the Free Software Foundation (FSF) for the GNU Project. It is similar to the GNU General Public License, giving readers the rights to copy, redistribute, and modify a work and requires all copies and derivatives to be available under the same license. Copies may also be sold commercially, but, if produced in larger quantities (greater than 100), the original document or source code must be made available to the work's recipient. On December 1, 2007, Jimmy Wales announced that a long period of discussion and negotiation between and amongst the Free Software Foundation, Creative Commons, the Wikimedia Foundation and others had produced a proposal supported by both the FSF and Creative Commons to modify the Free Documentation License in such a fashion as to allow the possibility for the Wikimedia Foundation to migrate the projects to the similar Creative Commons Attribution Share-Alike (CC-BY-SA) license. These changes were implemented on version 1.3 of the license, which includes a new provision allowing certain materials released under the license to be used under a Creative Commons Attribution Share-Alike license also. Although the two licenses work on similar copyleft principles, the GFDL is not compatible with the Creative Commons Attribution-ShareAlike license. However, version 1.3 added a new section allowing specific types of websites using the GFDL to additionally offer their work under the CC-BY-SA license. To prevent the clause from being used as a general compatibility measure, the license itself only allowed the change to occur before August 1, 2009. At the release of version 1.3, the FSF stated that all content added before November 1, 2008 to Wikipedia as an example satisfied the conditions. The Wikimedia Foundation itself after a public referendum, invoked this process to dual-license content released under the GFDL under the CC-BY-SA license in June 2009, and adopted a foundation-wide attribution policy for the use of content from Wikimedia Foundation projects. Critics consider the GFDL a non-free license. Some reasons for this are that the GFDL allows "invariant" text which cannot be modified or removed, and that its prohibition against digital rights management (DRM) systems applies to valid usages, like for "private copies made and not distributed". Notably, the Debian project and Nathanael Nerode have raised objections. In 2006, Debian developers voted to consider works licensed under the GFDL to comply with their Debian Free Software Guidelines provided the invariant section clauses are not used. However, their resolution stated that even without invariant sections, GFDL-licensed software documentation "is still not free of trouble", namely because of its incompatibility with the major free software licenses. Critics recommend the use of alternative licenses such as the BSD Documentation License or the GNU GPL. At any rate, it is likely that laws against computer trespass and malicious hacking will protect private copies even if usage of file controls is indeed forbidden. Most projects of the Wikimedia Foundation, including Wikipedia (excluding Wikinews) - On June 15, 2009, the Section 11 clauses were used to dual-license the content of these wikis under the Creative Commons Attribution Share-Alike license. The Virginia Commonwealth University Mathematics Department has begun commercially publishing mathematics texts licensed under the GDFL, including Abstract Algebra by Thomas W. Judson. 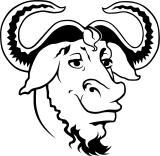 ↑ 6.0 6.1 GNU project: Frequently Asked Questions about the GNU Licenses: Why don't you use the GPL for manuals? ↑ "Wikimedia community approves license migration". Wikimedia Foundation. Wikimedia Foundation. සම්ප්‍රවේශය 2009-05-21. ↑ "Baidu May Be Worst Wikipedia Copyright Violator". PC World. 6 August 2007. සම්ප්‍රවේශය 10 September 2007. ↑ "Why the Wikimedia projects should not use GFDL as a stand alone license for images". Notablog.notafish.com. සම්ප්‍රවේශය 2011-11-07. ↑ Judson, Thomas W. (1997). "Abstract Algebra: Theory and Applications".